I did not like one thing about this book. The perils of my self-imposed Big Fat Reading Project. I only read Taylor Caldwell because she keeps showing up on the bestseller lists. There will be four more, but finally in the mid 1970s she fades away. Ever since she got on her weird variety of Christian writing, she went right downhill in my opinion. But people who read books for comfort or reassurance from a Christian standpoint seem to like her which explains how she made #8 on the bestseller list for 1960.The Listener is not even really a novel. It is a collection of stories connected by the visits of each character to an odd sort of shrine in an unnamed midwestern city. The shrine is named The Man Who Listens. People from various walks of life come and talk to a curtain, tell their troubles, then open the curtain and realize they have been talking to God. They see the answers to their problems and then go straighten out their lives.It felt highly contrived and gave Caldwell a platform from which she preached in a reactionary tone about the evils of modern society. I confess, I did a lot of skimming but kept on to the end. It did not get any better. In fact it got worse until I was gagging when I finished. I first read this book when I was 11 or 12 years old and it stayed with me for 30 years. I went on a mission to find and re-read it. Since it is out of print and my library did not have a copy, I searched ebay and found two copies - one hard cover to keep in on my shelf and one paperback to read and lend out to friends. No surprise that this book was still as wonderful as I had remembered from so long ago. Although written by a "romance" novelist, The Listener is in no way a romantic novel. It tells the tale of a wealthy widower who builds what can only be described as a non-denominational confessional. A place where anyone of any faith - or no faith at all - can visit with the title character and discuss whatever is weighing heavy on their mind/heart. Each person comes away from their visit to The Listener with a unique answer to their troubles. Some have deemed this to be a religious book, but I do not. I have always thought of this to be an inspirational message of one's journey of self discovery and learning how to listen to that soft, strong voice in their own heart.I've loaned out the paperback copy so many times that it is now starting to fall apart. Everyone who had read this book is as touched by the story as I was all those years ago. Written half a century ago, and sounds like today! I wanted to give this one 4 stars because it's core message deserves a solid 4 or 5 stars. But I got bored with reading the ins and outs of the different characters (or "souls") quickly. (Each chapter is a self-contained story and each character eventually makes a trip to go speak to the mysterious Man Who Listens.) After the second chapter, the reader KNOWS each person will end up going to the Listener. Therefore the repetition of the characters hemming and hawing about whether to go, as well as how they found themselves there, caused me to get impatient and want to speed though to the actual "listening" parts. The author could have made the book half as long by including half as many souls. Not only would I have gotten less bored, but more importantly, it would have an even more powerful and moving book. But if you are Christian or even Christian-ish -- especially if the latter -- the book is still well worth your time. I did enjoy it. Although published 33 years ago, I still found it pretty relevant. No real solutions, but keep an open mind. The author of this book has used pseudonyms. Incredibly MovingI first read this book in the 1970s and have re-read it several times since then. As the book was written in the 1940s it is truly amazing that the stories in the book are still so relevant today.I weep my way through many of the stories, even knowing what is to come. Somehow, they never lose the power to move me. Each person who comes has a different problem and Caldwell has the gift of giving each person his or her own voice. Some people come because they are in despair, others come without really knowing why they have come, some come because it has been suggested to them, others come because they have a problem with seemingly no solution, some come out of bravado not really thinking they have a problem at all, and if they did, some psychiatrist or clergyman wouldn't be any help anyway, some come because they want to "expose" it for the "sham" that they think it is.Not one person goes away without an answer. And no-one tells - ever.This book is timeless, as all human problems are timeless. Human nature doesn't change although societal attitudes certainly do.This book is a book that will stay with you long after you have turned the last page and it is a book that can be read again and again and still stay fresh. The stories are incredibly moving and have left an indelible mark in my heart.Taylor Caldwell is a gifted author and this book is my favourite out of all the books she has written. I have to admit, I read this book about 20 years ago so this was a re-read. It didn't have the impact on me that it had the first time - I suppose because I knew the ending. Really, it isn't about figuring it out but about faith and the stories of ordinary people finding comfort.I did enjoy the book - it still made me cry. This was one of the first books my mom recommended to me, so my enjoyment might have been more sentimental than anything else, but it was an interesting concept. A book that touches the spiritual side of the reader as individuals indulge in a sort of therapy or meditation by consulting an unknown counselor behind a screen with their problems, situations and concerns and somehow are led to knowledge and decisions that offer resolution. I read in the 70's and don't remember much about it. I liked this novel. I liked the concept that there was a place for people to go to, to just be Listened to, and I interpreted it as also being a place to get away from everyday life and stress, and feel safe, a place where you can just BE, if that’s what you want.Each chapter features an individual who goes to The Man Who Listens. I like the way each character begins by presuming and projecting attitudes and ideas onto the Man, until s/he finds him/herself talking about things they never did, and hadn’t meant to, and then the way they feel they heard him say something. I think Taylor Caldwell does a good job of describing how it feels to experience the Holy Ghost. I did a lot of hi-liting in this one!The Listener was written in 1960, and it’s interesting to read about how people thought about themselves, the world, and life – it reads remarkably similar to today. When I was growing up my mom kept this small quote taped inside a kitchen cupboard. It talked about the decay of civilization, the waywardness of the youth, etc., basically everything that we were hearing on the radio and TV in the late 60’s and 70’s. I asked her who wrote it and she just smiled. I was so shocked when she finally showed me that the author was Socrates! She said she kept it to remind her that things don’t ever really change. Well, while reading The Listener I had the same experience: for the most part we could be reading about 2012. Does anyone find this reassuring? I find it depressing – can’t we use this knowledge to break new ground, and travel a better path?The only negative is that it does begin to feel monotonous, since every character complains about the same things essentially, even if their outer trappings look different. Still, definitely worth reading. Ugh. What a piece of crap. Major Spoilers ahead so don't read it if you don't want to know what happens.Here's the book in a nutshell. Nice old guy has his house torn down and replaced with a chapel / shrine / theater /... whatever. It's a simple elegant little 2 room building. The sign on the front says "The Man Who Listens". The old guy dies and his estate is left to support the building . Each chapter is about a different person. Each one goes into a private room and talks to a closed curtain, telling about his or her problems. No one ever speaks back, although sometimes they think they hear a voice. By the time each person is done speaking, they have worked out a solution to their problem on their own. At the end of each chapter the curtains part, revealing what turns out to be, (duh), Jesus. The people, having now figured out solutions to their problems, give all the credit (of course) to Jesus. Because he listened. This book could have been so much shorter. "Talk to God, he will listen. You will then feel much better. "Here is something I'm very curious about but the book does not discuss. I understand how the old man could give up his house and have the new building constructed , but how did he make an arrangement with Jesus, who has been going to return any day now for the past 2000 years?I suppose it's possible that I, being a devout atheist, am not exactly the target audience for this book, but I have always been fascinated by religion. I find it fascinating, for example, that this book received over four stars on Goodreads. Fascinating and ridiculous. 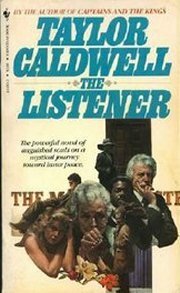 The Listener is a very unique novel that involves the reader as well as the characters. An "eccentric" has created a building that anyone with problems can go into and be guaranteed that someone there will listen, 24 hours a day, 7 days a week. Of course, the disbelievers scoff and ridicule this concept but the ordinary person ignores them and goes to tell their troubles to the Listener. Basically each chapter is a dialogue of the troubled one. Remarkably, the reader can pinpoint when the transition takes place in the dialogue of the participant. They end up solving or changing their perspective to their problem, and, if they wish, can push a button to see who the Listener is. This is when the reader becomes involved. We are expected to solve the question of who is behind the curtain. In each case, it is a different person, biblical, of course. I really enjoyed this book since in some cases I could relate it back to my day to day life and because of this, the problems seem less because of changing one's perspective. An eccentric widower builds a small, window-less chapel-type building in the center of a city, where people of all walks of life, and all manner of earthly trials can go to have conference within a room containing only a chair, a stage and a curtain. There is no person there, other than themselves; just a quiet peace, and this curtain. They have heard of this place from others who have been there, but they do not know what to expect or to whom-if anyone-they are speaking. Still, they feel some sense of a presence within; an unjudgemental listener. Feeling no condemnation from the curtain, the individuals who go there are free to express themselves, confide in the silence. What they find, or do not find, is conditional only upon their faith that someone IS there, behind that curtain, who cares. While I read this a very long time ago it's one I still think about from time to time. The biggest thing I took away is how important it is for everyone to have somebody listen to them, without judgment, without trying to 'fix' the problem, sometimes without even saying anything at all. Few of us have access to the kind of room in this book, but all of us have the ability to be a listener ourselves. It's been a couple of years since I read this book and it has stayed with me. Why? Caldwell has hit upon a subject which affects everyone ... the need to be listened to. Just by telling our 'stories' we get to move through what is troubling us. Hopefully we discover the silliness that is often in those stories that seem so deadly serious at first. Our societal sense of community is lacking today and I imagine this book will be a welcome read to many. I read this and its sequel over 40 years ago when I was on a Taylor Caldwell kick. Of course. these two books are very different from her typical novels. I was surprised and moved by them and I think they contributed in a small way to my young adult faith formation. I know my reading tastes have evolved and often when I try to re-read a book I am disappointed so I won't mess with my memory of them being worthy of 5 stars. So, this is a Christian book my mom gave me a long time ago and didn't read until college. Even though it is Christian, it's an awesome book. It kind of gives a non-denominational perspective on people's lives with their Christian lives. Really easy read, not very long, and set back in the early 1900's. I had a vague memory of this book and wanted to see if it held up with the passage of time. It did not. The message is wonderful, but the people are too set in a specific time period. It lacks the feeling of a timeless story. This is a unique book of "confessional eavesdropping," in which each character sounds off at "God" and then comes to the realization that "He" is always there for them...in all situations. It really uplifted me and made me think a lot about my own level of gratitude and depth of prayer. FULL REVIEW HEREI don't recommend this book at all. However, the good parts of the book were good enough that I am going to read some of Caldwell's other work. I love this book. We need more listeners in the world, more people who will try to understand though we can never fully understand. Caldwell presents the struggles of humanity, and she is also able to point to the answer every time, yet without losing the weight of hardship. Hey ---- Calling y'all Holy friends --- I know you will love this! Never thought Taylor Caldwell would write something like this! Very good book, makes you think. Read this years ago on the recommendation from my bride. Thought provoking, insightful and well worth your time. I really liked this book. It seemed to move from simple to complex and certainly made the case for being heard, in that it profoundly validated and energized the ones sharing with the listener. somewhat predictable, but well written!